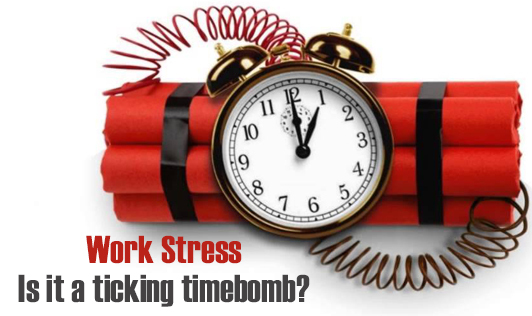 Work Stress: Is it a ticking timebomb? We all face sudden stress-inducing situations during our regular work day. Once you have addressed the issue, it usually goes away. However, ignoring increasing levels of stress could well turn out to be a ticking time bomb. When you feel overwhelmed during such situations, stop, take stock, evaluate your stress and find ways to cope with the stressors you face. Choose tips that work for you. 1. Learn to recognize when you are stressed. Feeling irritable, headaches, lack of concentration are symptoms of stress. 2. Learn to relax. A few minutes of deep breathing or relaxation exercises or simply a short walk can help you calm those nerves. 3. Prioritize tasks. Planning a to-do list will help. Setting short term goals and ticking them off when done is a great stress-buster. 4. Prepare yourself for a change. Take care of yourself, eat right, and start exercising. 5. Organize your desk. Keep your work area clutter free. It helps reduce your anxiety. 6. Learn how to delegate. You don’t have to do it all by yourself. Releasing control also releases stress. 7. Laughter is really the best medicine. Learn how to bring mutually shared humor into a situation, making sure that the laugh is not at someone else’s expense. 8. Listen to some relaxing music. It’s a great way to help you calm down. 9. Talk to a friend. Simply sharing your feelings with a friend or family member can be very beneficial. 10. Infuse positivity into your thinking process. Negative thinking can drain you and those around you.